No pressure…. the last post on my blog of the year and my 100th too. The last couple of days have been spent trying to think of a punchy great last post to write when it came to me this morning while lying in bed listening to the howling gale outside. Waking with an uncluttered mind, most of my inspired ideas for paintings come to me as visual images early in the morning as do ideas and starting points for writing. Here goes! With christmas over and the New Year on the horizon, I realised how excited I am about the arrival of a New Year. Yes..as simple as that. There hasn’t been much time for Art the last three months, so with a clear calendar for the next two months, there will be a lot of concentrated painting. With a commission, a solo exhibition in May, and enquiries for more Art Prints, it is going to be a goodun!. I am already looking forward to experimenting with some large canvas directly on the beach and using the our bijou winter beach hut as a haven from the weather, where I can be directly in touch with the elements which I hope will add an extra dimension to my work. 2012 was a great year with lots of new opportunities. I learnt to concentrate on and be grateful for everything I have and not to concentrate on what I don’t have which makes you want more, I realised that whilst my wallet is small, my heart is big, my tastes are simple but my dreams expansive, my faults are many but my merits more. So I wish everyone a Happy Prosperous New Year. Feel free to adopt my motto. “Smile, Inspire, Be Grateful” It comes back at you in bucket loads! 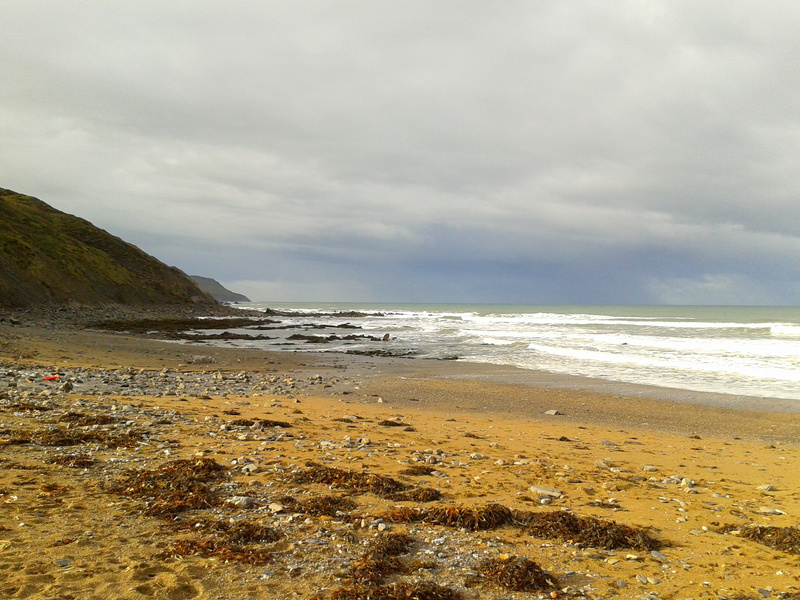 There are now two beach cleaning groups in the Bude area, who meet regularly to clean the beaches of the myriad of plastic that appears on our sandy shores. A previous post describes this beautifully with a lovely message called the Starfish Story. Winter seas wash in much more as the stronger currents throw the debris up onto the high tideline. Over the last couple of weeks I have been collecting scraps of fishing net and ropes with the idea of creating a Christmas Wreath. I have been amazed by the variety of colour. The very tangled pieces were perfect to form the shape of the wreath using the rope to keep it all in place. Here it is nearly finished. Just needing some sparkly led’s to make the xmas door complete. A mostly recycled beach find christmas wreath. After the coldest night of the winter so far, we weren’t so sure about heading for the beach, but once the sun came round it was glorious. With low sun shimmering on the surf, we scoured the tideline for driftwood and rope to make some christmas decorations. The beauty of being on the beach this time of year, is that you are often on your own. The rough seas of late have washed up a lot of debris, both from the sea and washed down the rivers. The other reason for going to the beach was to finish kitting out the bijou beachhut we have rented for three months. Just for the winter, it was cheap enough to have and risk the weather, but we are thinking we will be using it a lot. Cosy isn’t the word. After a quick lick of paint and brush up, I hit the charity shops to find old throws and curtains to add some colour into it. Lots of warm cosy winter colours. The beach hut is going to become the perfect studio after Christmas. I can keep out of the wind and paint the sea. Lovely! In the meantime, we are thinking it will be lovely for some lunches, breakfast and mulled wine get togethers. So the beach isn’t just for Summer after all. It seems to me two seperate paintings, the foreground with the hedge and road, and then the more distant sea and sky and nothing ties the two together. It could be said that this gives in distance and perspective, but it lacks harmony. So here is version number two. The hedge has greater depth and much more colour.To harmonise with the pink in the hedge I gave the sky more yellow light with pink tinges towards the horizon Bolder brushstrokes and more weight to the left was given to the cloud forms. The sea was given more depth This stronger light meant that the road needed more definate shadowing. This lifted the whole painting . So now it looks like one painting. Colours of Autumn are everywhere in the Landscape, but can also be found in the Seascape. 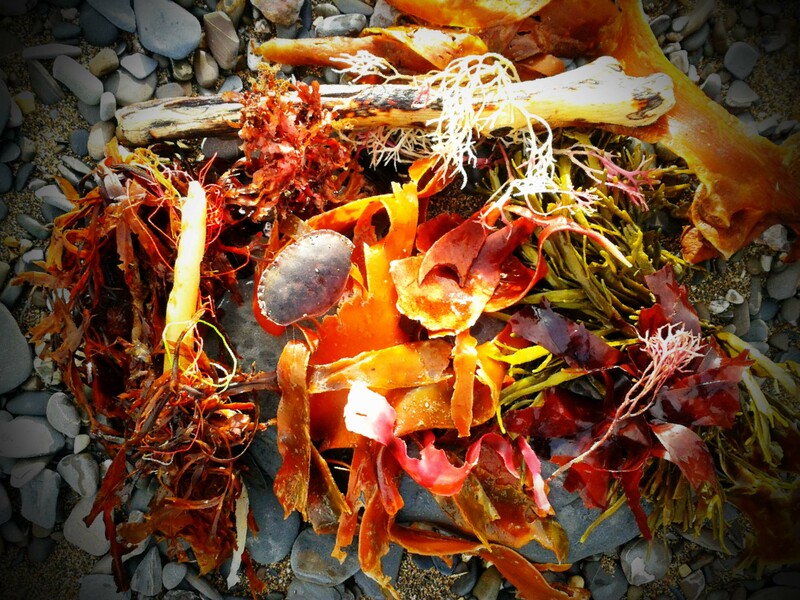 Here is a collection of things found on the beach this morning, full of beautiful autumnal colour! 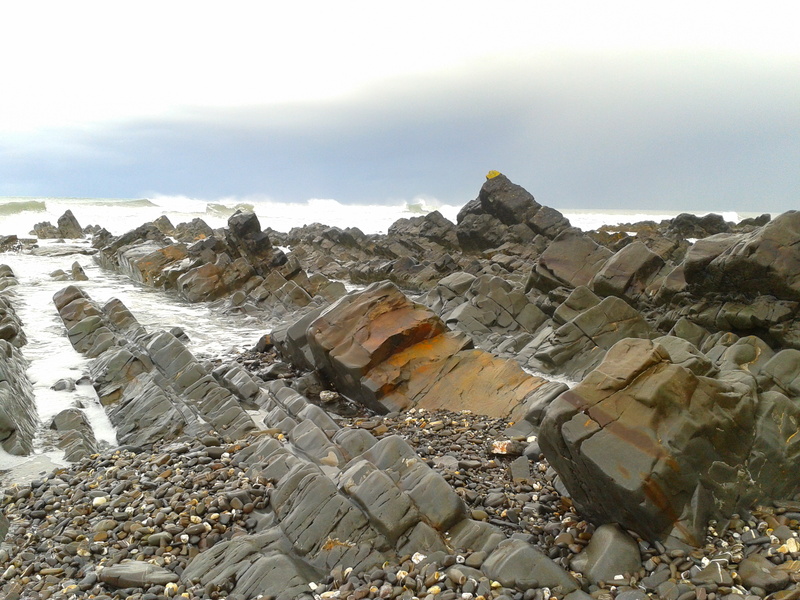 Wanson Mouth Beach is slightly off the beaten track. 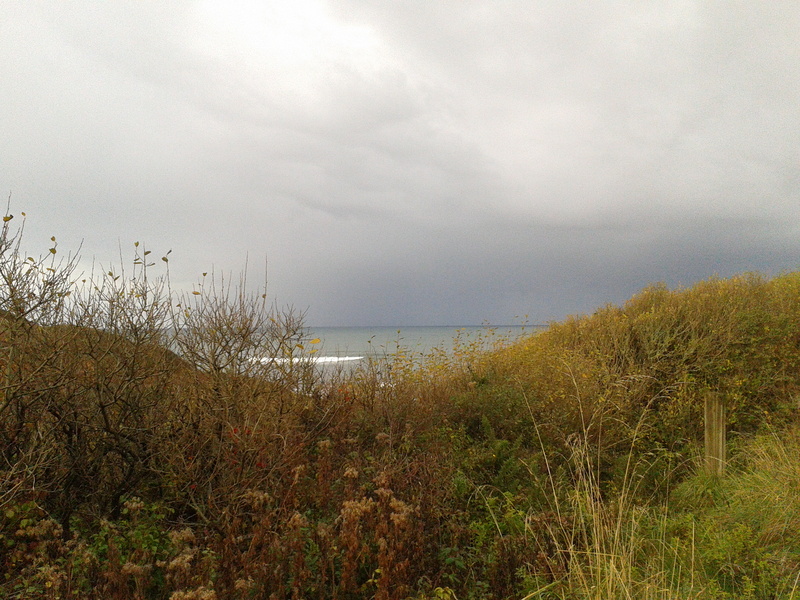 Accessed by a track over and following a stream down to the sea, it is not a ‘pretty’ beach, but is magical. Sometimes in an eerie way, but more because of the solitude. It is nearly always deserted and can often resemble a moonscape at low tide. Below the tide line, it is ribbed with sharp low rocks and few surfers brave it. It is quite stony and where there is sand it is a mix of ochre and greys and very gritty. Strewn with weed it looks grey green brown at first glance, but there is a lot of colour, shape and texture in the variety of weed which has been washed up. A rain cloud approaches in the photo above, looking south over the stream and towards Millook. Below shows the rocks to the north of the beach. Angular and grey with a beautiful flash of burnt sienna and foamy waves washing in. Somewhere, nowhere, but a place which touches me and inspires many of my paintings.